This beautiful glass paneling, by Keith Panel Systems, plays off the ever-changing ambient light conditions to create a playful dynamic exterior. 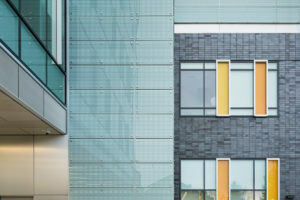 The effect is visually stunning & unexpected, the science behind the proprietary system provides a low maintenance & high R-value, ventilated glass wall panel system. This recent installation, at the Lethbridge Chinook Hospital, showcases 260 10-mm thick, drilled & tempered glass spandrels spanning 16,000 sf. Each panel was designed to play off the other. Each spandrel was screen printed in “Silver Lining” then roll coated with ceramic frit in “Ice Mist” to create a unique visual effect depending on the weather & time of day.